This new, single-volume resource provides the most complete guidance available for analyzing the cost and pricing aspects of federal government contracts—so you can propose and negotiate appropriate prices and win contracts. Throughout these pages, you will find highly detailed explanations of how the government evaluates proposals, arrives at pricing, chooses contractors, and awards contracts. 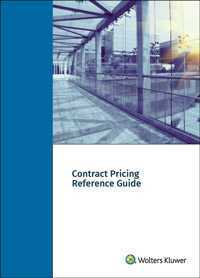 The all-new Contract Pricing Reference Guide provides a road-map for how to set correct pricing and engage in the competitive bidding process. It is a practical business tool to help you acquire government contract business—and it brings all the most valuable pricing information together in an easy-access, single-volume resource that puts everything you need literally right in front of you. No other resource delivers all of this together in one place, making it the most convenient way to obtain the most vital information on pricing government contracts.